When I was in college, my childhood cat Gremlyn died of mouth cancer at 13-years-old. She was an indoor cat, so I was expecting her to have had a lot more years left. We were very close and it was beyond hard seeing her deteriorate. I hardly left the house that summer just to hangout with her. Back then, we used to feed her whatever wet or dry food my mother would buy. I always wondered if we had taken better care of her diet if it would have made a difference. Either way, we weren't thinking about the ingredients she ate and how it would help her coat, health, etc. We didn't even pay attention to what we ate back then either. Now, that I'm older, I'm more aware of what I eat in general and only give my children natural and wholesome foods and ingredients, so of course I do the same for my two fur babies -- Patches and Bandit! 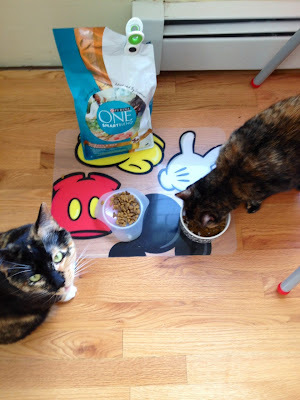 I recently started my girls on Purina One's 28 Day Challenge to see the differences made when you serve your cat proven nutrition in every dish. So, I transitioned them over to Purina ONE SMARTBLEND dry cat food, with Salmon or Chicken & Turkey being the #1 ingredient depending on which flavor you select. Another important factor is that this formula contains NO fillers, artificial colors, or flavors, plus has Omega fatty acids and Vitamin E for a healthy skin and coat. They also have different blends made for kittens and senior cats as well. The free program includes an online journal with tips for feeding and play, helping with picky eaters and keeping cats active and healthy. One interesting tip I learned was about switching the cat dish or bowl to one that is short and wide in order to avoid whisker stress. Cats use their whiskers to navigate their environment by measuring the width of openings to determine if it’s wide enough to pass through, thus their whiskers should not be touching their feeding bowl. Looks like we need new bowls. Also, if you have more than one cat, each should have their own bowl. We already do this, but it was nice to re-evaluate how we do things and make sure we're giving our cats what is best for them and not just easy for us. Since the challenge I noticed that both of my cats have silkier coats and that they eagerly munch on the dry food even over their wet food. We're already way past day 28 too. Disclosure: I received cat food coupons to participate in the challenge, but donated the remaining coupons to a local feral rescue.